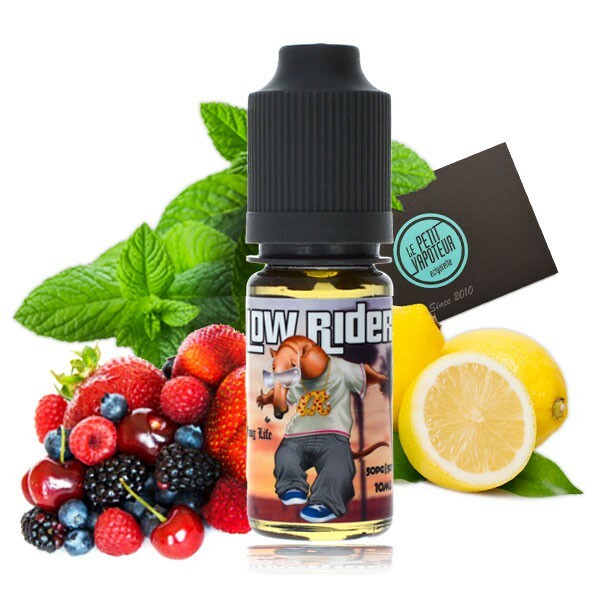 The Low Rider now exists in a 10ml version with a composition of 50/50 in PG/VG to vape with a large number of clearomisers and Atomisers. Low Rider : Range Fuug Life of The Fuu. Fresh, Sweet, with a Light Lemon taste, which can be vaped in roundness gracious to the subtle Forest Fruits. Ultra Gourmet but not sickening. This little gem is possible to enjoy in a classic tank. Available in a 10ml vial with a Nicotine level of 3, 6, 9 mg/ml. Made In France By The Fuu. The E-Liquids Fuu are developed, produced, bottled and Labelled in Paris. The Fuu work with known suppliers which systematically communicate the security data corresponding with products purchased and delivered. The provenance of Vegetable Glycerine and Propylene Glycol are French. The Aroma Flavourings used are French, English, American and German. They meet the highest standard of the Agro Food Industry. Each batch which is bottled can be traced with minimum detail gracious to the spreadsheet of production and recipe data held with care. The same is used for ingredients used. The E-Liquids The Fuu are regularly controlled (Chromatographic and microbiological analysis) by many independant laboratories. L'un des meilleurs comme d'habitude. Et comme d'habitude, on attend toujours qu'il sorte en arôme.